The Walther PPX is the newest offering from Walther. The composite PPX was designed as a low maintenance, minimal effort gun that would shoot accurately at a reasonable price. If you are considering this gun, or have one already, you might be wondering what holster has proven to be the best available. Our research into the best holster for the Walther PPX leads us to believe that the IMI-Z1425 holster is the best option available. We give this holster the nod because it provides excellent comfort, weapon safety and customization. 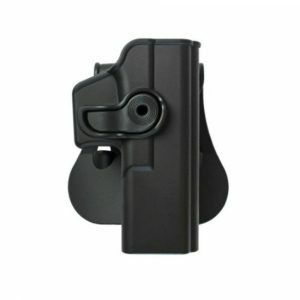 This holster will keep your gun by your side, accessible and out of sight, if necessary, without any major drawbacks. While some guns have a plethora of choices, such as some holster manufacturers offering up to 40+ choices for Glock guns alone, the PPX is still new enough not to have a large quantity of bespoke holsters. There are a few strong options available, of course, from other strong bespoke PPX designed holsters to a few universal holders that the PPX will work with. Few gun makers have the sort of cultural cache that Walther does. Walther has existed since 1886, and they have earned an excellent reputation over the years. The quality of these guns has never been disputed. Walther has always had a reputation as being European in the best sense, pairing form and function to make attractive weapons that work reliably. Walther is also credited with some important design innovations, including single/double action triggers, fire pin block safety and decocker lever. It was the quality and superior versatility of these guns that inspired British intelligence agent Ian Fleming to use the PP7 as the weapon of choice for his most iconic literary character: James Bond. Bond has used either the Walther PP7 or Walther P99 as his sidearm of choice throughout the duration of the popular film series. While most of the Walther guns offer both style and substance, the PPX was designed to be a lower cost option. Rather than skimping on the substance, the PPX was made cheaper by Walther skimping on style. The result is a composite 9mm gun that matches many of the popular features of the controversial Glock with a heavier tactile feel to the trigger and a handle reminiscent of other Walther offerings. If you liked the P99 but wanted a composite, a cheaper option or wanted a weightier triggered alternative to the Glock, the PPX might be a perfect choice. The PPX is a relatively new offering. It has only been on sale since 2013. As a result of its relative youth in the market, it lacks a lot of the tactical add-ons that are so common with other models. The lack of additional features makes it easier to find high quality holsters for the PPX today, but today’s easy review might create tomorrow’s difficult choice, as a new holster may be required when new features or optional adjustments are added on. For now, at least, the decision on which holster was the best choice was made with a few review priorities in mind. Nobody wants to get shot. The outright embarrassment of having people visit you in the hospital while you’re laid up because you shot yourself is easily the worst case scenario. Almost all holsters have some kind of mechanism which allows you to adjust how securely the gun is being held, but bespoke holsters, those designed specifically for the PPX, are given extra consideration. Universal holsters have their place, of course, and may provide the best option as add-ons for the PPX filter into the market. Any holster that offered additional security features, such as mechanisms that make it hard for the weapon to be taken away from someone by force, are given additional bonus points. Whether safety or draw is the most important aspect of a holster is open to interpretation. 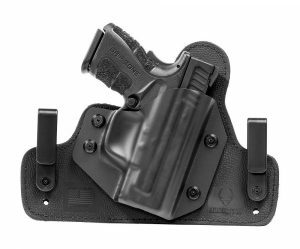 A quality holster should deliver both excellent safety and ease of access. While there are a wide array of uses for a weapon, from personal protection to target practice, there is no use for a gun that is stuck in its holster. A holster’s ability to hold the weapon safely while also being easy to draw is a high priority for this review. Nobody wants to replace the same holster over and over again, so finding a holster that was built out of sturdy material was a serious consideration. Polymers, or advanced plastics, are the most likely to last for the long haul. A holster made of durable plastics and made specifically for the PPX was an obvious choice as our highest rated option, which was a factor in why the IM-I2145 was chosen. A few of the other options were made of polymers, as well. Leather can be tricky. The right companies uses high grade leather that won’t break, crack or generally age poorly; the wrong companies will use junk leather that might not last a year. A leather holster is nice, typically comfortable and sturdy; choosing one made of good materials, however, could only be determined based on customer reviews. Nylon can be a total crap-shoot, and without some kind of plastic or metal to stabilize the holster, you may find it to feel flimsy or unsecured. That tended to be the case with the options currently available. Whether a holster is concealed or not concealed depends on you, the purchaser, as well as relevant laws in your state. In some states, there really isn’t a debate to be had; in some states, getting a concealed carry permit is more difficult than successfully solving linear algebra equations written in Japanese while intoxicated. It would be unfair to present an argument to a broader audience that encompasses multiple countries a review of a holster based solely on whether it can be concealed or not. In general, the concealed / non-concealed discussion centers around outside waste band (OWB) or inside waste band (IWB) options. Assuming you have a concealed carry permit, this question is entirely dependent upon your personal preferences. Once again, no special consideration was given towards one choice or the other. We would strongly encourage people to buy a holster that complies with all relevant laws, of course, so if you live in a state that does not permit concealed carry, a shoulder holster is likely off the table in public settings. For shoulder straps, polymer or leather holster options were given a much better rating than nylons. As stated, the PPX lacks the fit and finish of other, flashier, options. It makes sense that a gun bought for utility should not have aesthetics as a primary decider in what sort of a holster is best for it. While looks should never be a primary consideration, it’s good to get that off the table, just in case. The review is entirely based on function. Cool patterns, nifty leather and good looks are nice, but totally irrelevant for the purposes of this review. This is a bespoke option designed specifically for the PPX. The IMI-Z1425 offers both additional security and an easy draw by providing a release button in a convenient location. This holster offers everything we would look for, as well as good looks. 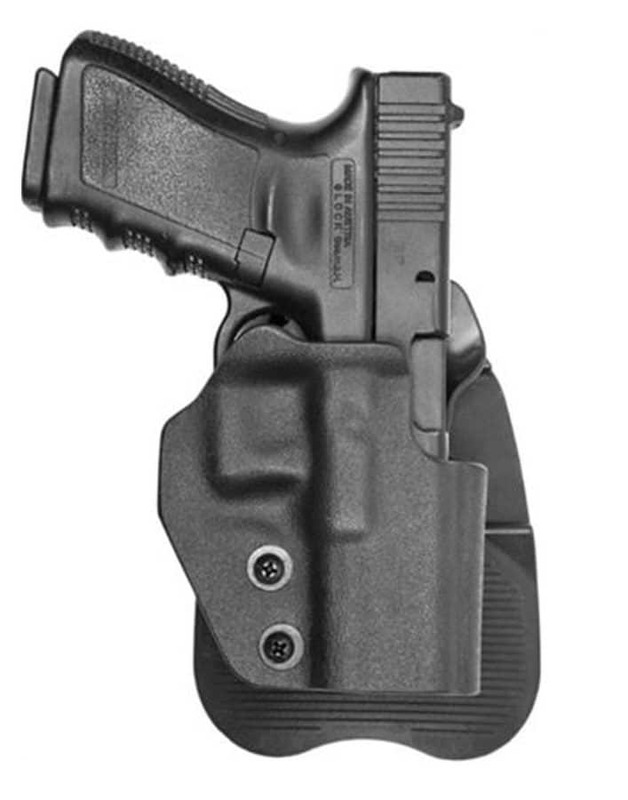 This holster has gotten excellent customer reviews and even gets praise for being comfortable. This is a simple paddle designed polymer holster. While it does not offer any additional safety features, it has quick access in a compact frame, offering stability and comfort. 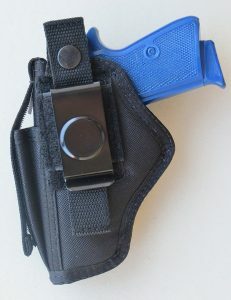 This holster is well reviewed and easy to utilize. No safety feature is a drawback, as is its universal design. 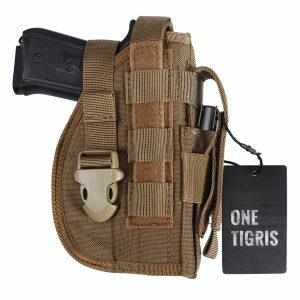 This universal holster offers a nylon approach with an easily accessible safety strap. It has solid customer reviews and provides better weapon security than many of its competitors. For those who prefer nylon, this is an option that has both a safety feature and an OWB construction. This is a simple nylon design. It’s as straightforward as it gets. For those who are not interested in safety features or plastic composite designs, this is a simple but well reviewed option. This is a simple and straightforward, “I just want a holster,” option. This is a “universal” holder, designed to handle a number of different guns. It’s well constructed of sturdy materials. This IWB design is perfect for concealed carrying of the PPX. Based on reviews, this is the best universal holster for IWB comfort and use. Once again, because the PPX is a newer option, the wide range of possible holsters and accessories are not necessarily on the market yet. 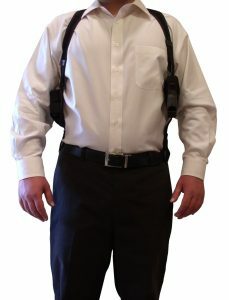 This universally designed shoulder holster comes complete with a double-clip strap design. This is the highest rated shoulder strap for the PPX, but when bespoke holsters come to the market, they will likely offer a better fit and feel. Our choice is the IMI-Z1425, a bespoke composite holster that checks off all of our boxes. The simple catch system prevents anyone from taking the gun away while also allowing for easy draws, providing you the chance to protect yourself without having to worry about having your gun taken from you. Adding those features to a holster with an excellent build quality and durable materials puts the IMI-Z1425 as the best holster we reviewed. If you’re looking for something different, there are other choices, but if you’re looking for a holster that has the functionality and utility of your PPX, the IMI-Z1425 was our favorite choice.